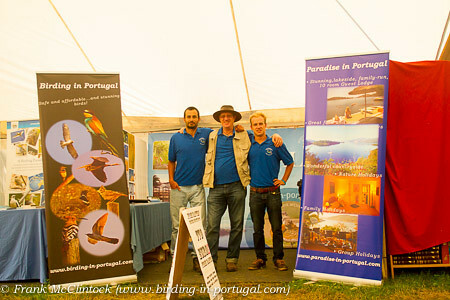 Birdfair 2013-1607, originally uploaded by Paradise in Portugal. Another year, another Birdfair! Wonderful to have the chance to chat to so many old friends there and we’re looking forward to the next one already. However, let’s have a Salgados update before I dip my hand in the bag. Your response to my request for comments on the EIA was humbling. So many of you wrote in and the government offices concerned have been swamped by well over 700 emails of disgust that this development should still be on the cards. I hope we’ll be able to swing them around. They have a few of weeks left to read all your emails and then we’ll find out what they’ve decided. In the meantime we’re trying to talk to as many politicians as we can – there are fuller details on my Birding Blog about this, and I will post up there any news. I must take this opportunity though to let it be known that I wrote twice to Dr. Artur Rego, the Algarve’s MP, to ask for his views on this matter. He never replied, which was upsetting but probably gives an idea of his thoughts about this. A point to bear in mind in the forthcoming elections! On a more positive note, we have a very well known national politician holidaying here at the Quinta and I will be trying to get him on our side over the next week during dinner. I’m also in touch with the Wetlands Manager for the World Wildlife Fund thanks to an introduction from an old friend. He in turn has raised Salgados with the Regional Advisor for the European Region at the Ramsar Convention Secretariat and they will be having a meeting later on this week where Salgados will be at the top of the agenda. Now it’s just a waiting game …. but let’s not wait any more as regards the raffle, so who feels lucky? We drew the Raffle once and only one of the lucky winners claimed their prize, (well done David Brooks), so we’ve drawn it again and the winners’ names are published on our Birding Blog.